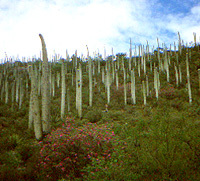 The cactus in this picture from southern Puebla is Cephalocereus columna-trajani. Like the Column of Trajan in Rome, Cephalocereus columna-trajani is tall, white, and has no branches. It's surreal and almost eerie to see hillsides covered with these huge plants, each one with its tip pointed slightly southward like ranks of giant, ghostly people all looking in the same direction. The shrub with magenta flowers is Morkillia in the Zygophyllaceae.